What light should light up on the Smart Inventor board if the sumo bot program is on? Il y a sur Internet des dizaines et des dizaines de sites pour trouver des projets de robotique! Mots-Clefs: projets de robotique pour débutant, projets Arduino, etc. etc. 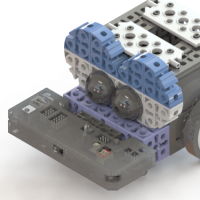 There are on the Internet some dicades and dicades of sites for finding robotics projects! Key-words: beginner's robotic projects, Arduino projects, etc. etc. Un simulateur serait peut-être utile pour un projet très complexe, et je suppose que ce simulateur fonctionnerait en 3D. Personnellement, je mets toujours des instructions de débuggage dans mes programmes; après compilation, je peux avoir une bonne idée du fonctionnement en laissant branché le kit à mon ordinateur de bureau avec le câble usb, sinon je le teste débranché en observant les comportements. A simulator would be perhaps useful for a very complex project, and I suppose that this simulator should work in 3D. Personally, I always put debugging instructions in my programs; after compiling, I can have a good idea about the functionning by leaving the kit plugged with the usb cable on my desk computer, otherwise I test it unplugged by observing it's behaviour. Another project: A simple automata. An other little project: Pendulum. Controlling the robot with a Web Application!? A follow-up to "Restoring 11 preinstalled programs"
The four channels on the remote control. Personally, I leave the lower section of the cable on the board, and I unplug only the upper section, the USB cable going to the computer. @robolink_carl Thanks Carl for answering me so quickly. The first paragraph about the file 160322 is the best information for me. As I said, I had already read everything about the documentations on the site. My suggestion was to insist about memory management and restoring the default programs. I think it would help to understand more deeply how the 11 programs work and how the choice of a program is programmed. This will be sufficient for me, and your answer will hopefully help other persons.